A dramatic video is providing more details into a collision between a school bus and a commuter bus on a New Jersey highway last month. The on-board video taken during the Jan. 10 crash in Old Bridge was released Wednesday. It shows the frightening moments when an Academy Bus traveling from Lakewood to Manhattan smashed into a school bus that was making a right turn off Route 9. Passengers can be heard screaming as the driver is seen desperately turning the steering wheel to try and avoid the school bus. 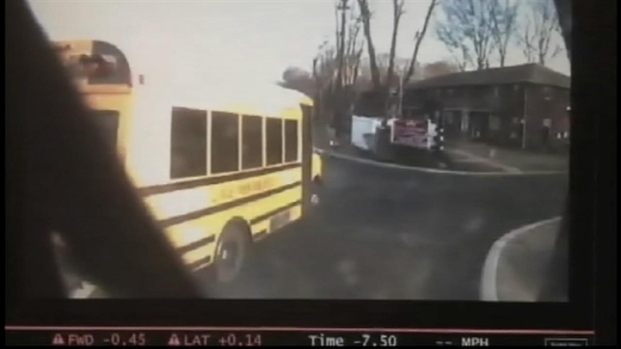 Nineteen people were injured when a commuter bus traveling on Route 9 in New Jersey crashed into a school bus last month; now video from inside and outside the bus has surfaced, showing the terrifying moments. News 4's Ida Siegal reports. No children were on the 24-seat school bus, but the driver and an aide suffered minor injuries when the bus flipped over on its side. About 30 people were on the commuter bus. Two, including the driver, suffered serious injuries.